The Hotel Edward of Igea Marina has unattended parking, WI-FI connection throughout the entire hotel, kitchen with organic dishes, fish every day, cooking for intolerant, allergic and baby menu. This hotel adheres to the Green Booking project and has decided to donate a tree to the coast for a healthier environment and a more sustainable tourism. 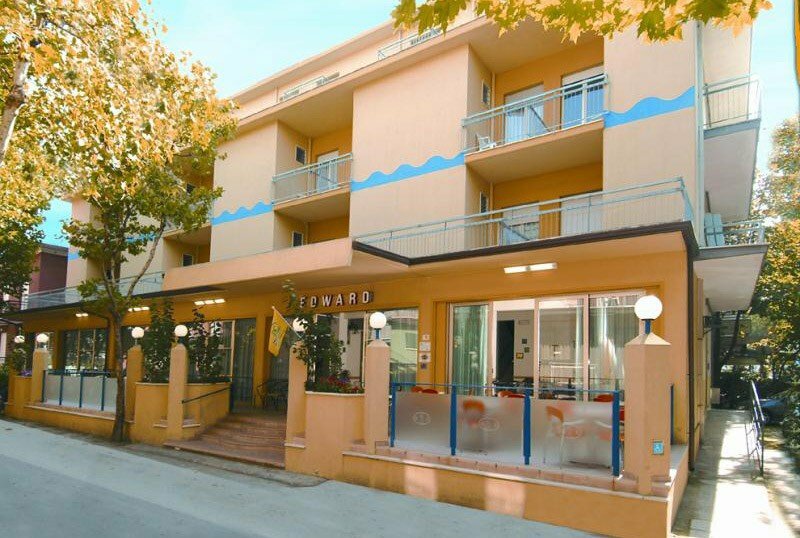 The hotel is located near the beach of Igea Marina, which can be reached in less than two minutes on foot. The central pedestrian area is also within walking distance. Nearby the property is the Parco del Gelso, a city park that also houses a sports center. The rooms have a balcony, air conditioning, ceiling fan, WI-FI, TV, telephone, safe and private bathroom with hairdryer and shower curtain. Breakfast in the room on request. FAMILIES : family solutions available. Open-air porch, terrace, 5 bicycles available, lift for disabled, bar and living room with TV and newspapers, welcome drink on arrival, entertainment and theme nights. Conventional swimming pool at 20 meters, at the Nautilus hotel. PARKING : uncovered, available for all and paid. CONVENTIONS : beach, discos, swimming pool, order strength. Discounts for the theme parks of the Riviera. SERVICES FOR DISABLED : entrance on the ground floor with a sloped ramp, an elevator in accordance with the standards, rooms and a disabled bathroom, an accessible shower and a shower chair. BREAKFAST : buffet with homemade cakes, biscuits and organic jams, toast, cold cuts and cheese. LUNCH AND DINNER : local cuisine with two menus to choose meat and fish, followed by a buffet of side dishes, with cooked and raw vegetables. Pasta and desserts are homemade. VARIATIONS : vegan and celiac cooking, possibility to agree on dishes suitable for those suffering from intolerances, allergies and for children. In the hotel : strollers, entertainment, indoor and outdoor playground area. In the room : cribs, cots with side rails, WC reducers, baby baths. At meals : high chairs, baby menu, baby food and afternoon snack. 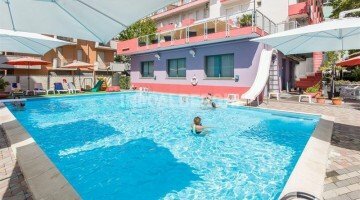 Guests can use the swimming pool located at the nearby Nautilus hotel (50 meters away), equipped with a trampoline, a shallow water area for the little ones, a slide and a furnished solarium. The hotel has an agreement with the Bagno Solaria Beach n. 86, equipped with beach volleyball court and beach tennis, entertainment for children, fitness area, playground, pedal boat rental. Throughout the summer at the Hotel Edward, children are free or discounted! Live Easter with us with our special offer in B & B. Free parking, not far from the structure. Grafic Wi-Fi service on all rooms and in common places.